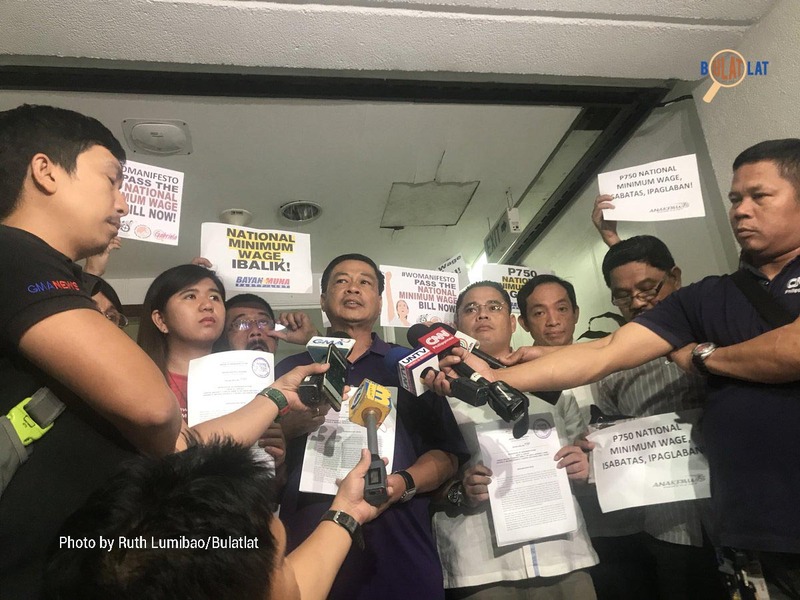 MANILA — Today, May 28, legislators from the Makabayan bloc of the House of Representatives, joined by trade union organizers from Kilusang Mayo Uno (KMU) and the KILOS NA Manggagawa Alliance, filed the National Minimum Wage Bill (House Bill No. 7787). 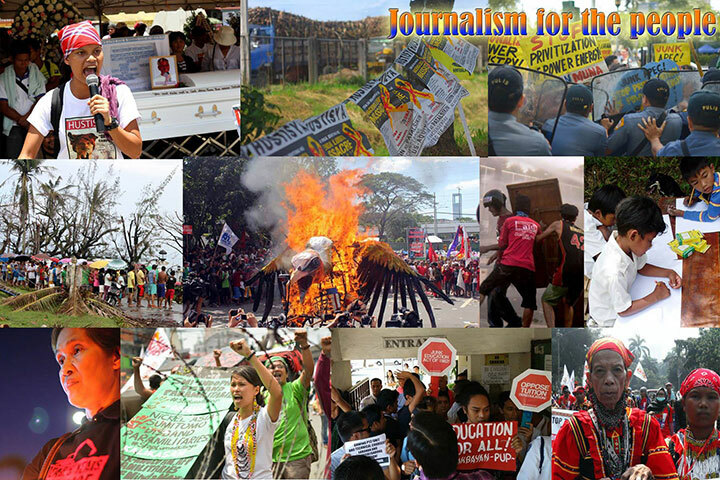 Workers and peasants held a picket protest outside Batasang Pambansa. 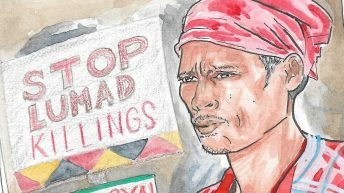 Bong Labog, chairperson of KMU, explained that the proposed legislation effects an increase in wages — from the meager PhP 512 minimum wage pegged only in Manila to the proposed PhP 750 minimum wage to be applied nationwide. The proposed legislation also prescribes the abolition of Regional Wage Boards (RWBs), tasked with the adjustment of wages per province, based on the estimated cost of living. Legislators and workers challenged President Rodrigo Duterte to fast track the passage of the bill, citing that it is already long overdue and even more crucial at the present time, given the sudden increase of prices caused by the Tax Reform for Acceleration and Inclusion (TRAIN) program. This meant, however, that despite the similar prices of goods across the country, wages differ. In fact, Gabriela Women’s Partylist Representative Emmi De Jesus pointed out that the current minimum wage in the Autonomous Region in Muslim Mindanao (ARMM) is only PhP 263 — about a half lower than the minimum wage in the National Capital Region, set at PhP 512. RA 6727 created regional wage boards, tasked with making the necessary adjustments in the minimum wage. “The regional wage boards have only ensured a ‘race to the bottom’ among regions in terms of wages, and that approved wage hikes throughout the years have been measly,” De Jesus explained in highlighting the necessity to abolish these boards. 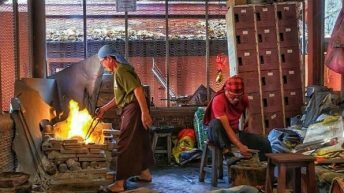 Wage rationalization also dilutes the reality that the cost of living depends on many variables, and the result is many families in the countryside have found it hard to cope with expenses given the high prices of goods. “It is wrong to assume that there is a low cost of living for those in the provinces while prices of goods continue to increase because of transportation and other logistical costs. 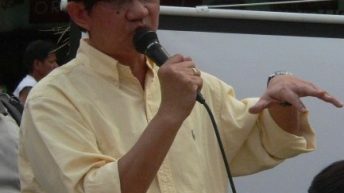 It has already been proven that because of the monopolistic control of the hacienderos and traders, products like rice, vegetables, meat, and others are brought to markets like the NCR and other regions, so it does not necessarily mean that these products are cheaper,” Anakpawis Partylist Representative Ariel Casilao said in Filipino. In the explanatory note of the bill, the Makabayan solons cited how prices have increased up to more than 500 percent while wages have remained low. In fact, the average real increase of minimum wage for the span of 28 years that wage rationalization has been a state policy, is only PhP 89, in stark contrast to the increase in the prices of goods. With the implementation of the TRAIN law, the highest recorded inflation rate this year has been recorded at 4.5 percent. Prices of goods, even those not supposedly affected by TRAIN, have also inevitably increased because of the domino effect caused by the surge in oil prices. “Truth be told, the wages of our workers have long been stunted and its purchasing power gravely diminished. 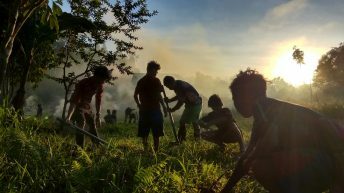 This amount is still short of the Php1,168 needed daily to support a family of six as of March this year based on a study by the thin-tank IBON Foundation,” said Bayan Muna Partylist Representative Carlos Isagani Zarate. 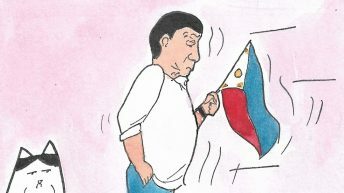 “Despite the constant increase of prices due to inflation, aggravated by the exponential increase of prices due to the anti-poor tax reform program the Duterte administration continues to defend, and the deceptive ‘increase’ in gross domestic product (GDP) that the government always boasts about, wages have remained stagnant and patently insufficient for workers in the country,” Kabataan Partylist Representative Sarah Elago said in a statement, highlighting how the current minimum wage no longer suffices for a decent living. While session in Congress is expected to end on Wednesday, May 30, KMU Chairperson Bong Labog vowed to continue the call for a national minimum wage. “We hope that this bill gets immediately legislated because of the terrible increase in the inflation rate, most especially caused by the TRAIN law. This is only the first phase of the tax reform packages, and we can see that its effects are already drastic and the current wages of workers can no longer suffice,” he said in Filipino during an interview after the filing of the bill. “This is a reminder that we should strengthen the workers’ movement, and we can expect workers to actively lobby and mobilize for the passage of the National Minimum Wage Bill immediately when the Lower and Upper Houses of Congress convene again,” he ended. 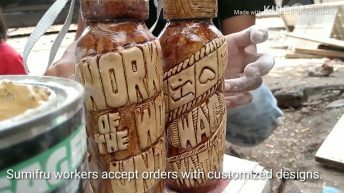 Right after the bill was filed, Presidential Spokesperson Harry Roque immediately dismissed it as ‘legally impossible’, but KMU maintains that it will strengthen the campaign for a national minimum wage through successive protests to be conducted not only in Metro Manila but also in other regions.